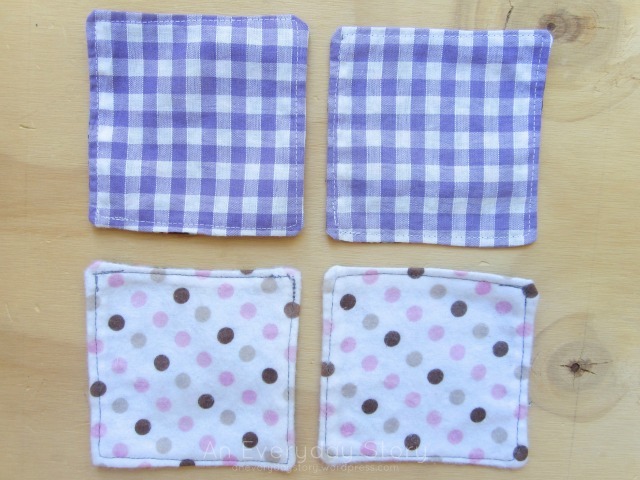 These beautiful little squares were given to Sarah (22mths) for Christmas. They are such a simple and thoughtful gift, perfect for Sarah. 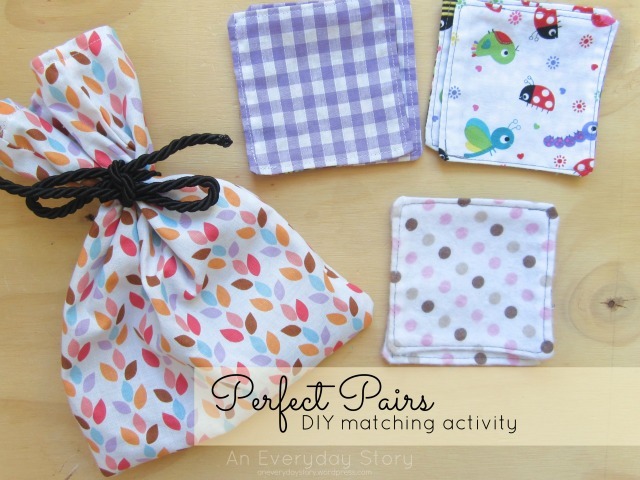 They are a set of 12 matching pairs. 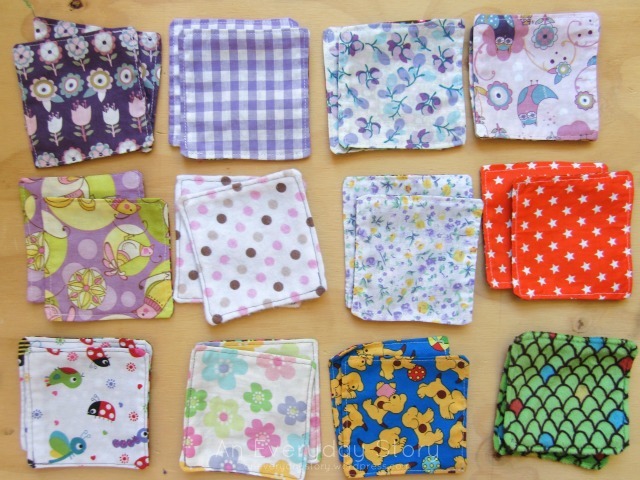 Each square measures 10cm x 10 cm (approx. 4″x4″). Wouldn’t they be the perfect way to use up all those scrap pieces of fabric we have around the place? To start with, Sarah really liked simply playing with the squares, looking at them all, moving them from one pile to another. Then, like with the wooden eggs, I introduced matching, by giving her one pair to match, then two pairs, three.. and finally all twelve pairs. At this stage I still need to lay out one set on the carpet for her and Sarah will match the others from a pile next to her. In time though she will be able to do this herself. I also really like that each square has the same backing fabric so the game can be extended to a memory game for Jack (3.75yrs). We started with two pairs and now play with three. It’s incredible for Jack’s concentration and he really enjoys the challenge of finding a matching pair. 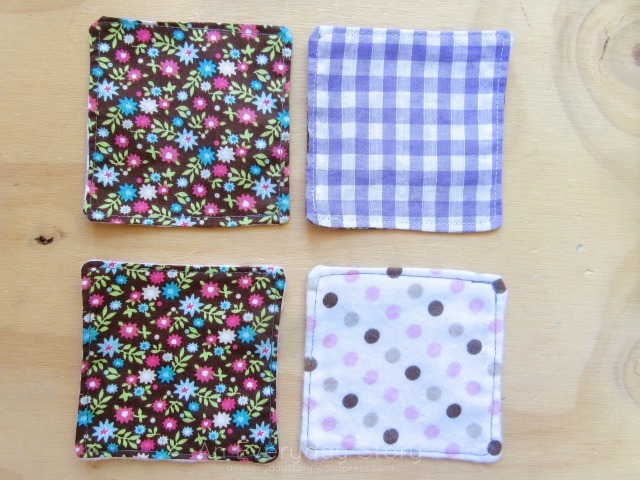 I imagine these little squares would be crazy simple to make, just cut and stitch. And how beautiful are they in their little carry bag? We love them. What a great present! So pretty, and I love the simplicity of this idea, but so many options too! oh these are so adorable. i love the prints. Oh what a thoughtful gift! And such a beautiful idea. Hand made for our kids really is priceless. I wish I could sew. This game is absolutely delightful. A friend of mine made something like that. Then she embroidered around the edge of each letter so they were tactile as well. She said it took a little while but well worth it. They turned out beautifully. What a simply wonderful gift…i really like the idea of the backing being the same pattern so you can extend the activity…i am all inspired to make some now!! You should Jode 🙂 A Friend of mine suggested more textured materials for a sensory activity which I thought was a great idea. Simple and beautiful, and such a lovely tactile game at the same time!